So the issue picks up where the last one left off. Plutonian has realized that Qubit doesn’t intend to send him back in time in order to not commit the horrible atrocities he’s done since snapping. Plutonian is understandably angry, but Qubit manages to force him to hold up his end of the bargain by placing the only thing that can kill him, in his heart. Using the last of Bette’s gravity warping powers, Plutonian manages to scrub the Earth’s atmosphere clean of the radiation threatening to kill everyone. 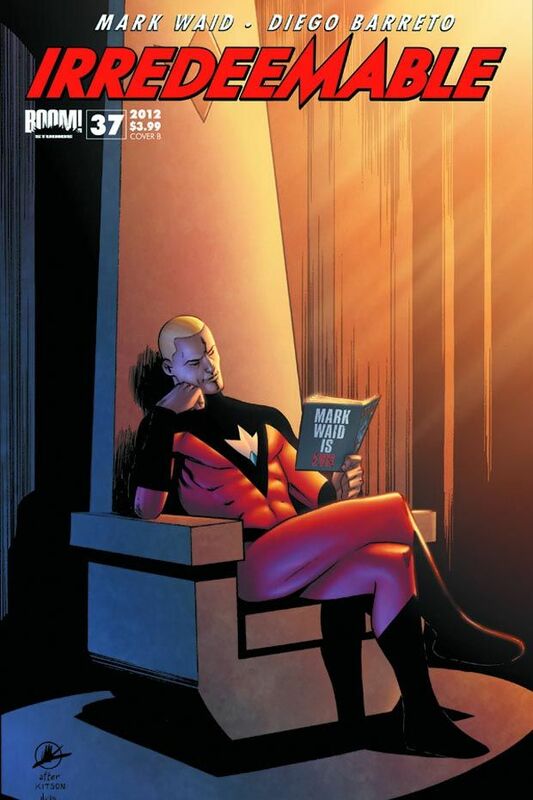 All I can say to Mark Waid is, “good one sir.” I have been blown away by the quality throughout Irredeemable and this issue is no different. Waid has been able to take archetypes and mold them into a great universe and story and for that I commend him. He also gets major points from me for the last panel, was not really expecting that. Diego Barreto’s pencils really help convey everything in this issue. Facial expressions, something I am very critical of, were a strong point of his art here. You can see the anguish on Plutonian’s face after he gathers the radiation, and Qubit’s excitement when he realizes that Plutonian saved the planet. Those expressions really help sell the the action and plot. All I can say is ‘wow.’ This has been a phenomenal series. I’m tempted to make this a rating of the series as a whole, since this is the last issue, but I’m gonna try and rate this one just on the merits contained within. As an ending to a series, this is as good as you could find. All the bases are covered, and for a tragic character like Plutonian, a chance at redemption is the perfect fit (for more information, scroll past the rating). Parental concern: None really for this issue. Stop reading if you don’t want the last panel spoiled. Alright, you asked for it. Since Qubit sent Plutonian’s essence out to find redemption, it latched onto Siegel and Shuster. If you don’t know who that is, I’m not gonna explain further. I am very anxious to read this issue. What an amazing series by an amazing writer! Yeah, in my mind I was concerned that it would be impossible to redeem this character, but Waid pulled an awesome and did something out of the ordinary. At first I was bummed, more because I wanted the character to have some sort of personal redemption, but in the end it is much more thoughtful than anything I could have dreamt up. I love how my initial thoughts when starting this series, “man this is like a screwed up Superman,” comes full circle in the end. Excellent series, and refreshing to read something that has closure.